Lead students through the creation of their own pinhole camera with this basic construction kit. All the necessary supplies are included for creating these economical viewers. 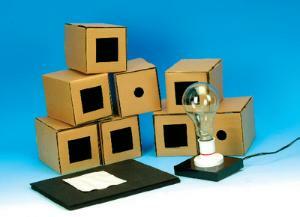 Kit features eight cardboard boxes, each measuring 150 x 100 x 100mm and fitted with a hole. Screen and lid, filament lamp, 50 sheets of 200 x 250mm black paper, one 60W lamp, one mounted lamp holder, and one packet of pins are also included.